Emilie and I have been working hard on getting together the book version of this blog, due out in the fall, and she saw this sign in the midst of it. She writes, "Sure, its day job is being a sign, but it has other interests, too." 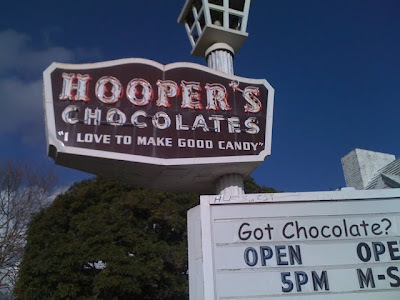 Perhaps I'm biased (I've lived about a mile from Hooper's for the last twenty years), but I don't consider this an inappropriate use of quotation marks. Hooper's is a long standing local institution (or perhaps was, it seems to be closed again at present) and I suspect this quote--mundane as it is--was probably an utterance of Mr. or Mrs. Hooper. Agreed - this works. The quote is presumed to be by the owner... Mr. Looper, I presume? Correct use of quotes. "FAIL."